Community gardens are common in cities all over the world. They provide a shared space for communities to work together to grow produce and learn new skills. They benefit individuals by giving people access to fresh, organic produce, by promoting physical activity, and by stimulating learning and adding to a person’s knowledge and expertise. Community gardens also have social benefits through promoting community interaction, providing a venue to meet new people and building a sense of community. The campus community gardens are part of about a dozen community gardens in Christchurch. The vision of UC's community gardens is "To create an attractive, living campus that is transitioning into a resilient, edible biophilic landscape". The mission of UC's community gardens is "To nurture a community of people who grow and share food, and use their knowledge to influence campus design and policy". UC Community gardens have some simple operational guidelines which help to keep the gardens a safe, welcoming place to visit and work. Okeover Community Garden utilises permaculture and organic growing methods. This means food production in the garden is becoming more sustainable – no pesticides or chemical fertilisers are used, and there is an emphasis on creating a self-supporting ecosystem and using natural processes. This produces healthier food and is better for the environment. Growing your own food is also better than buying it. It reduces the environmental costs associated with transportation and storage, and food will also be fresher and tastier. There is also the satisfaction you get from growing your own produce. By participating in the community garden you also have a chance to learn about sustainable gardening techniques which you can apply in your own garden at home. The community garden is an excellent place to put sustainable theory into practice. You learn by doing, and have fun and meet new people at the same time. As an added bonus, you can take your share of the fresh produce harvested that day! The Okeover Community Garden was established as a recreation and learning space for anyone else associated with UC. The Dovedale Community Garden is currently being used by Okeover community gardeners as a satellite garden to grow staple crops. Permaculture means permanent agriculture and organic growing is about working with natural systems. Anyone associated with the UC or living nearby is welcome to volunteer in either of the community gardens. 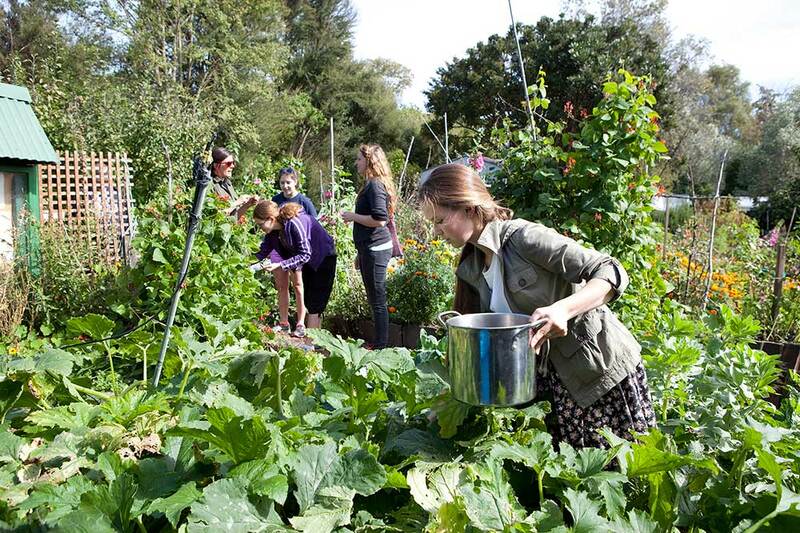 The Kakariki Environment Club proposed starting a community garden on campus in 2000. The gardens create an attractive, living campus that is transitioning into a resilient, edible biophilic landscape. Internet resources for community gardens, food resilience, permaculture, organics and biodynamic gardening. The UC Sustainability Office is a hub for individuals and groups interested in sustainable practices at UC and the wider community. The UC Sustainability Office is located on level 2 of the Facilities Management Building on Engineering Road.